The likelihood of the rebellion succeeding, however, remains slim, for no credible challenger to Pelosi has yet been announced. One week after the election, 150 protesters from the Sunrise Movement and Justice Democrats blocked Pelosi’s House office to demand action on climate change. They were joined by the youngest member of the incoming Congress, Alexandria Ocasio-Cortez. 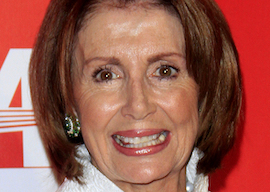 Pelosi declared herself “inspired” by the protesters, 51 of whom were arrested. She urged police to let them exercise their democratic rights and pledged to revive the House Select Committee on Energy Independence and Global Warming, which Republicans abolished. Dismissing the committee as “toothless,” the protesters demanded that Pelosi’s party commit to bringing an end to the use of all fossil fuels and to accepting no more campaign contributions from the oil and gas industry. Not going to happen with Pelosi as speaker. For when it comes to the leftist agenda of liberal Democrats from safe districts — Medicare for all, abolish ICE, impeach Trump — Pelosi would pigeonhole such measures to avoid the party’s being dragged too far to the left for 2020. Moreover, within Pelosi’s party in the House, the various factions are going to be demanding a new distribution of the seats of power, of which there are only so many to go around. From special counsel Robert Mueller’s office will almost surely come new indictments, trials and the long-anticipated report, which will go to the Justice Department, where Matthew Whitaker is acting attorney general. Trading barbs is not Nancy Pelosi’s kind of fight.